At what has to be the best corner for food trucks in the city, there’s an interesting jockeying of position going on. One day, Paty’s Mexican arrived with its fantastic tortas, agua frescas, and tacos. Then the 24-hour Shaban Halal truck moved its position from 86th Street near 3rd Avenue to park right across from Paty’s on Lexington (which also delivers!). 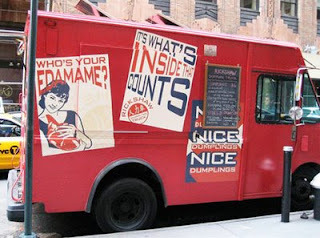 The next day, the “polished” Rickshaw dumpling truck, which uses recipes created by Chef Anita Lo of Annisa, joined the fun. And all three overshadowed the smaller guys on the avenue: the honey-roasted nuts truck and Mister Softee. An added bonus beyond the excellent food doled out at these trucks: You can stand over the subway grates while you wait for your order and find out whether your train is on time. Thanks, I will go investigate. All tips are welcome. I'd love to find the "roaming" trucks. If anyone spots them, please let me know. Which dumpling do you recommend? I like both the vegetarian and the chicken ones. Both come with delicious dipping sauces, too. Does anyone know where this truck disappeared to?